What is that all about? More money wasted. It's in the back of the manx tails apparently. They're employing someone to go out and talk to people and give away car stickers etc! 16+ Thousand pound a week and this is the sort of thing it is being wasted on. I've also just been told that Andy Wint is on Energy now, Sunday Mornings. Not seen it on their schedule. Interests:disco-dancing when I get the chance and socialising generally. I'd like to help poor people and travel. Well if Energy think that is a good move it is up to them. I thought Andy Wint exited rather quietly out the back door of Manx Radio. He was certainly very much a part of the radio station - only about 7 days a week - and had an opinion on everything. He was certainly an intelligent man and for example picked up on the various issues of the Mannin Line straight away. But he was his very own nemesis when he tried to outwit the likes of Charlie Williams and whichever other TT star Charlie was chatting with on Radio TT about matters TT and biking. So . . . . Energy FM . . . . bring it on. and Manx Radio . . . ? - stick to your standards, all in all you're sounding not too bad these days. I hope it is true, On the radio Andy was a god-send each morning for many years. Less of the backroom goings on and getting on with a show can't be bad. I really wish him well if it isn't a wind-up. Hope it's true, one of my customers reckoned they heard him say something along the lines of "join me this sunday..." I never heard it, not had the radio on lately. I think the point that I was trying to make was that by the end the people of the Isle of Man had all had far too much of Andy Wint. It took a few years for us Manxies to suss him out though. It took TT fans about 5 minutes. I wonder if Andy Wint will be tuning in to the Mannin Line on Manx Radio after his show? Is there anyone on 3 f(or) m(orons) who isn't a Manx Radio has-been? I actually listened to all three stations this morning. 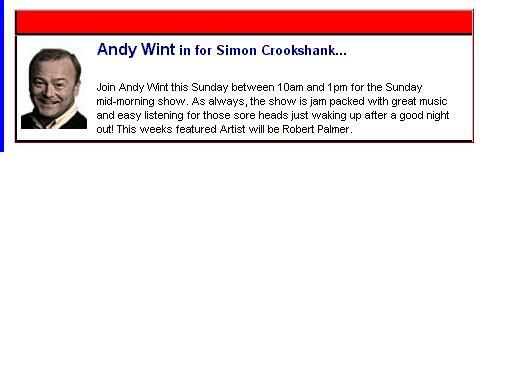 And I listened in to Andy Wint although not for long enough to tell if it was just another of his recorded shows like his last lot were on Saturday morning Manx Radio. Perhaps Desperate Dan would let us know if it was the great Andy himself in person in the Energy FM studio in the Isle of Man in Market Street. Or was it a recording. But in any case, apart from the adverts, I could have been listenening to Radio Ipswich or Radio Chiltern or whatever. But for a Sunday morning and with the possibility of a hangover I would find Andy Wint's voice rather intrusive. Which reminds me...I see/hear that the Government now advertise on Energy FM too. I heard the advert about the 60mph thing. So is radio advertising/propaganda now costing us three times as much now there is a bit of 'competition' for Manx Radio. Anyway, back to my Sunday morning listening. 3FM was bland wallpaper sort of listening. That is not meant as derogatory because I occasionally might like that sort of thing. Say, when I am doing the wallpapering or something. Manx Radio with Brian Stowell on Bob Harrison's show was the usual pretty interesting stuff. Plenty of strong opinion put over as fact by Brian Stowell but I think Bob Harrison kind of keeps him in check. And the occasional music thrown in is pleasant enough for Sunday morning. I love to criticise MR having been a listener most of my life, but it is going to be difficult for the other two to break Manx Radio's hold on the Island's listening public. That is, unless Manx Radio start doing things which make perhaps more people want to look for the other two radio stations over here. I'm getting fed up with Brian Stowell, especially his anti-nuclear ranting. I know there are more interesting people out there with an extensive knowledge of the Island, it would be nice to wheel in a replacement and put Brian Stowell out to grass for a while. There's much more to the Island than the Manx language. On this morning's programme Brian Stowell told us the Isle of Man were against Nuclear Power. He didn't qualify his statement, for example with ''generally it would seem that the Isle of Man is against Nuclear Power'. He just spoke for us all. Us thickos that aren't very clever because we don't have a few degrees behind us. And he went on to suggest that the TV Simpsons was an indication of the Nuclear Industry. No tongue in cheek. No laugh in the voice. Thankfully Bob was there to bring the ship onto a more even keel. As I say, plenty of strong opinion put over as fact. Maybe I should wallpaper my hallway next Sunday. When is juan going to start up a moanin line? he has got Mr Wint so why not.